In January 2018, Paris Aéroport saw 7.6 million passengers, an increase of 4.5% on January 2017. 5.2 million passengers travelled through Paris-Charles de Gaulle (+4.9%) and 2.4 million through Paris- Orly (+3.8%). International traffic (excluding Europe) was up by 5.1%, due to growth in the following destinations: the French Overseas Territories (+10.8%), Africa (+8.4%), the Middle East (+6.3%), North America (+3.5%), Asia-Pacific (+0.4%). Only Latin America was down (-1.2%). The number of connecting passengers increased by 4.0%. The connecting rate stood at 26.0%, stable compared to January 2017. Passenger traffic at TAV Airports, 46.1%-owned by Groupe ADP, increased by 30.1% in January 2018. Passenger traffic at Santiago de Chile airport, 45%-owned by Groupe ADP, increased by 12.9% in January 2018. 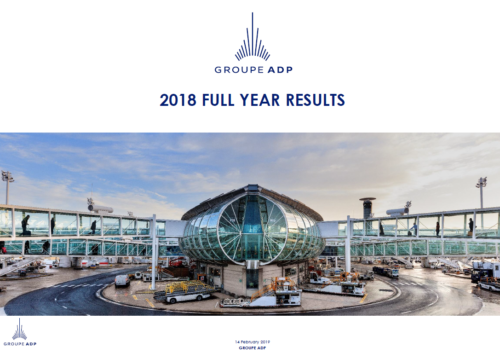 (1) Groupe ADP and TAV Airports have,a shareholding of 21% and 15%, respectively, in Zagreb Airport. To be compliant with TAV Airports presentations, Zagreb Airport traffic figures are integrated into the TAV Airports group traffic figures.